Listening to books being read to you is such a great way to pass the time when you have long drives. I remember buying cassette tapes, then CDs to listen to “books on tape” over the years. Now all you need is an App on your phone and a way to get the sound to play thru your vehicle’s stereo system. If your car or RV stereo has a headset jack, you’re all set. Otherwise you need to pair your phone’s bluetooth connection to the radio. If you don’t know how to do that, you can watch our Bluetooth segment of episode 24 of What Does This Button Do. If your radio has neither, there are FM transmitters to make it work. So, what’s the catch? Well, you have to buy the books and they can cost anywhere from $3 to $30 each! One option is to get the app Overdrive, which allows you to borrow books for free from your local library. But notice the word, “borrow.” You don’t own the book and must return it in a specified time period. All of this has stopped me from getting audio books until now. I am an Amazon Prime member and I use it all the time to get free shipping, and to watch free movies online. Starting September 13, 2016, you get free audio books with your Amazon Prime membership. Audible is an Amazon company. Just like Amazon Prime Movies, they offer a selection of book titles and more that you can listen to for free with your audible app if you are an Amazon Prime member. The selection changes and is rather limited, but I actually enjoy not have too many choices! Published by MrsGeek, in Blog. 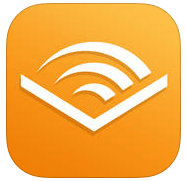 Tagged with Amazon Books, Apps for Travelers, Audible, Audible Books, Blogs, Books on Tape, Geeks on Tour. Am I to assume that you would have to have constant data connection and a how much data does it consume. Yes! Audible Books do use significant data. I listened to about 3.5 hours yesterday and my data manager recorded 540MB used.